Railpictures.ca - John Eull collection Photo: Running late on a cold February day, CPBU makes its appearance at Kinnear Yard. Today’s power is Conrail GP40-2 3317, GP38-2 8231, another CR GP38-2 and a TH&B GP7. In a little over two months, Conrail power through Hamilton on a daily basis will be history when CP takes possession of the eastern end of the Canada Southern and integrates it into the TH&B as “CP Rail (CASO)”. | Railpictures.ca – Canadian Railway Photography – photographie ferroviaire Canadienne. Copyright Notice: This image ©John Eull collection all rights reserved. Caption: Running late on a cold February day, CPBU makes its appearance at Kinnear Yard. 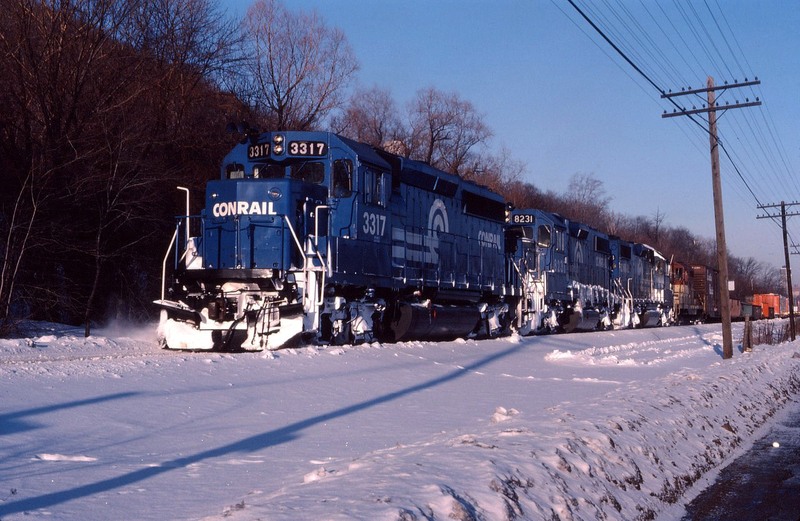 Today's power is Conrail GP40-2 3317, GP38-2 8231, another CR GP38-2 and a TH&B GP7. In a little over two months, Conrail power through Hamilton on a daily basis will be history when CP takes possession of the eastern end of the Canada Southern and integrates it into the TH&B as "CP Rail (CASO)".